Learn Spanish in Spain! Bienvenidos! 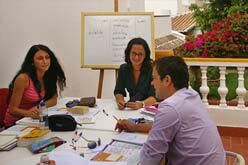 Welcome to Escuela de Idiomas Nerja (Language School Nerja)! Sprachkurse-weltweit would like to introduce you to Escuela de Idiomas Nerja, a Language School in Nerja and tell you about the variety of Spanish courses on offer, about the activities and accommodation possibilities t- up to your highest hopes and expectations. Escuela de Idiomas Nerja invites you to come to Nerja (50 km from Malaga), a seaside town full of charm, to study the Spanish language effectively and become acquainted with andalusian culture, all in a homely, relaxed atmosphere, and in a natural setting of beaches and mountains with a sub-tropical climate all the year round. All in all, it is to be trusted that you will find your stay there an unforgetable experience.